Big radar performance and features are available for any size boat -- and budget with the SI-TEX T-761. A vertically oriented, slim case boasts advanced touch screen technology and a host of professional features. Powerful 4kW output ensures superior target acquisition and tracking in the the most challenging conditions. The T-761 Series case measures only 5.4" W X 8.9" H X 3.5" D. Yet, this system boasts a long list of professional-grade features, including powerful 4kW output, up to 48nm range, multi-speed antenna rotation, standard 50-target AIS tracking capability and standard 10-target MARPA - features often associated with larger, costlier systems. Control of all these features is achieved via the T-761's touch screen LCD display and single rotary encoder dial, for simple, intuitive operation. The T-761 features a 24-inch radome antenna that delivers a narrower beamwidth, resulting in excellent target resolution and increasing the effective range up to 48nm. Both the T-760 and T-761 feature powerful 4kW transmitters, ensuring accurate detection and presentation of targets large and small. Both models also offer multi-speed antenna rotation (16/27/36/48rpm) for optimum target detection and tracking over a range of boat speeds. Among many other notable standard features of the T-761 Series are Relative Motion, True Motion, North-Up, Head-Up and Course-Up presentation modes, Auto or Manual Sea/Rain Clutter modes, 11 Trail Indication settings (including Off and Continuous), and more. With input from a SI-TEX Metadata AIS module (or other AIS receiver), the T-761 Series can track up to 50 AIS targets simultaneously for enhanced navigational safety in crowded waterways. With input of bearing, ship's speed and lat/lon data, the T-761 Series empowers navigators with professional MARPA tracking of up to 10 targets at distances up to 20nm. 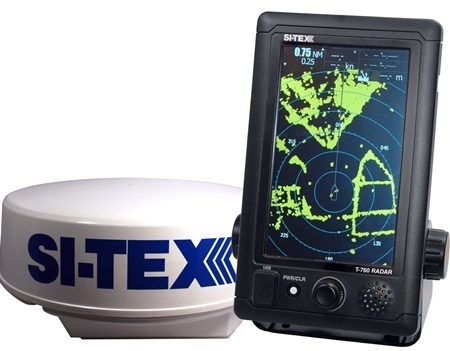 In the SI-TEX tradition, the T-761 Series radar is ruggedly built to withstand harsh conditions at sea on commercial as well as recreational vessels. SI-TEX's two-year limited warranty and Long Island, New York-based service department are the navigator's assurance of reliable performance and long-term satisfaction.